Don't Ask. Don't Tell. SHOW. There seem to be folks on the right who remain unclear on the concept -- not the least among them, Attorney General nominee, Michael Mukasey. 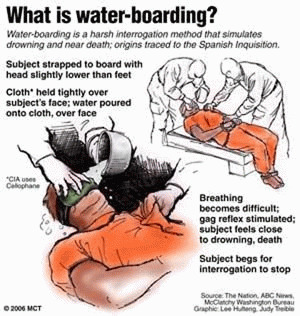 The concept they can't seem to get a firm fix on is whether or not the interrogation technique known as "water-boarding," -- making a person think he or she is being drowned -- is or is not "torture." I don't know about you, but it sure as hell sounds like torture to me. But there are still those in this administration and Congress who support the technique and claim it is not torture. Websters: Torture is any action taken against another person that causes, "anguish of body or mind agony: something that causes agony or pain. Anguish: "extreme pain, distress, or anxiety." MedTerms medical dictionary: Torture: An act by which severe pain or suffering, whether physical or mental, is intentionally inflicted on a person, for a purpose such as obtaining information or a confession, punishment, intimidation or coercion..."
When asked during his confirmation hearings if water-boarding was torture, Mukasey said he couldn't really say, since he was not familiar with the details of the technique. Which is a kinda hard to swallow since the technique has been described in excruciating detail in the popular press since it first burst into the national consciousness a couple of years ago -- thanks to Vlad the Hoser at 1600 Pennsylvania Ave. But all the publicity surrounding water-boarding seems to have left at least some public officials on the right unclear on whether it's torture or not torture. Some seem to feel that water-boarding is no more cruel than forcing a cat to take a bath. Which is why I've concluded the only solution is to stop telling and start showing. 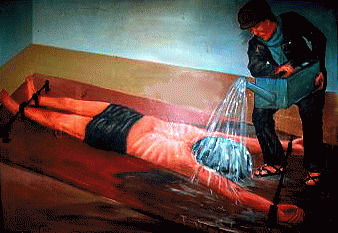 And what better way to get a handle on the concept than for those who support the technique to step up to the plate and declare, "I say water-boarding is not a form of torture, as described by national and international law. And. to prove it I am submitting myself to the process." And what better place to hold water-boarding demonstrations than a well -- the well of House and the well of the US Senate. Proponents who claim water-boarding is not torture because it "causes no physical injuries, leaves no marks and causes no permanent harm," should therefore have no problem, right? Climb on the water-board and take a spin. But, there's more than just a quick demo. For this demonstration to be useful it must be a genuine interrogation in every way possible. That means not only using the same equipment used at Gitmo and other secret interrogation centers, but the same assumptions. Those the CIA water-board are assumed to know something useful or to possess secrets. So the members of Congress and administration who agree to be water-boarded must also be assumed to hold a secret. Otherwise it's not an interrogation. Since it has to be an incriminating secret let's make it so.